Yes, that’s right VEGAN cassoulet! I was inspired by a recent post on The Lentil Institution to make cassoulet, that oven-baked, but sadly very meaty, bean dish so beloved by the French. I confess I did love this dish once, the idea now is awful, but when I think about it, it is really the beans that are the highlight. At its heart, cassoulet is a bean dish, flavoured with whatever else is to hand. For a vegan that means delicious vegetables. There is no reason why we cannot have the luxurious pleasure of this long cooked, warm bean casserole with a crunchy breadcrumb topping. The herb flavours are the same, the textural contrast to the beans is supplied by root vegetables, and the umami flavours are supplied by mushrooms and a really toasted flour and oil/’butter’ roux. The flavours are built further with carrot, onion, garlic, sweet potato and leeks added to the mix. You could use your own favourite vegetables too, though I’d steer clear of cabbage, cauliflower, broccoli or brussels sprouts. They are just too strong, even though I love them. The roux is darker than the familiar white one we normally use for a bechamel or “white” sauce. It is responsible for a lot of the flavour of this dish, so don’t even think of taking a shortcut in the step of making it. I actually didn’t know that roux came in any type other than the normal pale one we use, but I was watching an old episode of Alton Brown’s Good Eats a year or so ago, that was devoted to making roux for sauces. He made several roux in a range of toastiness. Apparently they come in blonde, peanut butter, chocolate and brick among other shades. I find Alton Brown hugely entertaining, part science, part cooking technique, part history, part comedy. You just need to pick the episodes. I just watch the veggie ones. But I digress, back to the dish…It takes a long time to cook, but most of that time is unattended, so it isn’t demanding to make. I also like that it can be cooked in one pot. If you don’t have a pot that can do duty on both the stovetop and in the oven, then it will take two pots. 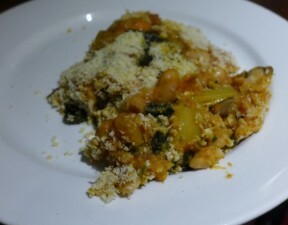 A traditional cassoulet has the breadcrumb crust stirred into the the bean mix to thicken it, and then it is allowed to crust again. Some accounts say this needs to be done seven times! This version uses the roux for flavour. It also thickens the sauce so there is no need to do this breaking of the crust. I am sure that the French would think this dish sacrilege. Frankly, I don’t care. It is delicious. My final dish in the pictures is not great, there should be more liquid left, it should ooze nicely from under the crust. I made the mistake of not leaving enough liquid before putting the crumbs on. That last 15 minutes of cooking absorbed more liquid than I thought it would. But it still tastes great. You’ll need to start this at least the day before you want to eat it. The beans need soaking overnight, and the cooking time is at least 3 hours. But it is definitely worth the wait. Drain the beans, rinse and cover in hot water. Heat the oil/butter in a large ovenproof pan and add the flour to make a paste. Cook, stirring occasionally over a low/medium for 30 minutes (yes that's right) until it is a deep golden colour like peanut butter or even darker. While the roux is cooking, finely dice the carrot and onion, smash the garlic and halve or quarter the mushrooms. When the roux is a deep golden to tan colour add the carrot, onion and garlic to the pan and cook further until the onion is transparent. Add the mushrooms and the leek cut into 5cm lengths. Saute further until the mushrooms and leeks soften adding more oil if needed. Pour in a small glug of wine to loosen any bits from the pan and add the drained beans, tomatoes and 1½ cups of the stock. Stir, bring to the boil and add the potato cut into 4cm chunks. Cover and cook in a preheated 160 degree C oven for 1 hour. Add the sweet potato cut into 4 cm chunks. Add extra liquid if needed and return, covered, to the oven for another hour. Check and add extra liquid if needed. Cover and return to the oven until the beans are cooked and completely tender. Add the kale, check if it needs salt and any extra liquid and cook for another 30 minutes. Remove from the oven, make sure there is enough liquid (it should be a bit more soupy than you want it), cover with a layer of breadcrumbs and return to the oven to cook uncovered until the crumbs are golden. The liquid will bubble up from underneath around the edges. This looks like really good comfort food for a cold winter’s day. I’d never even made (or perhaps even eaten) a cassoulet before I made mine, but I loved it. I’ll have to give yours a go next time I have a free afternoon to cook.